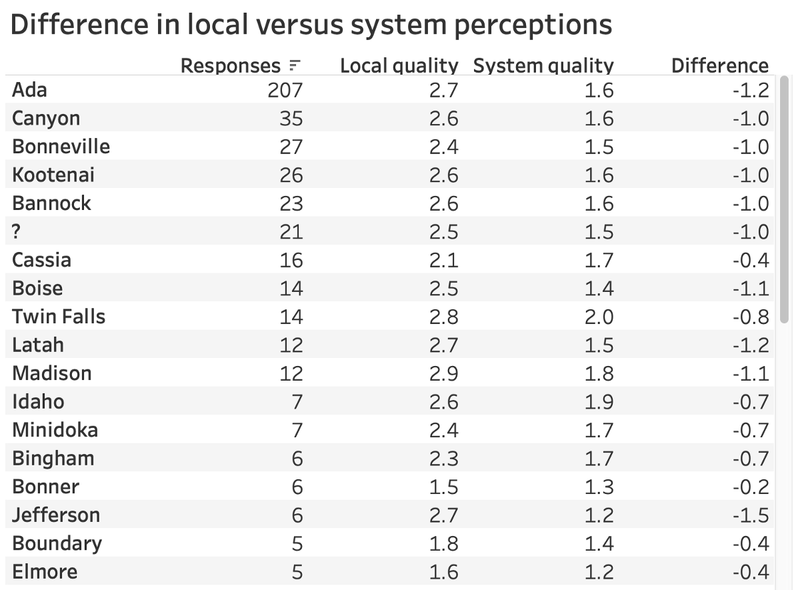 Respondents perceive the quality of their local schools as better than the quality of the state system of education. This was surprising, and kind of feels like the fact that most people think they’re above average. Respondents agree that most kids should continue their education after high school. 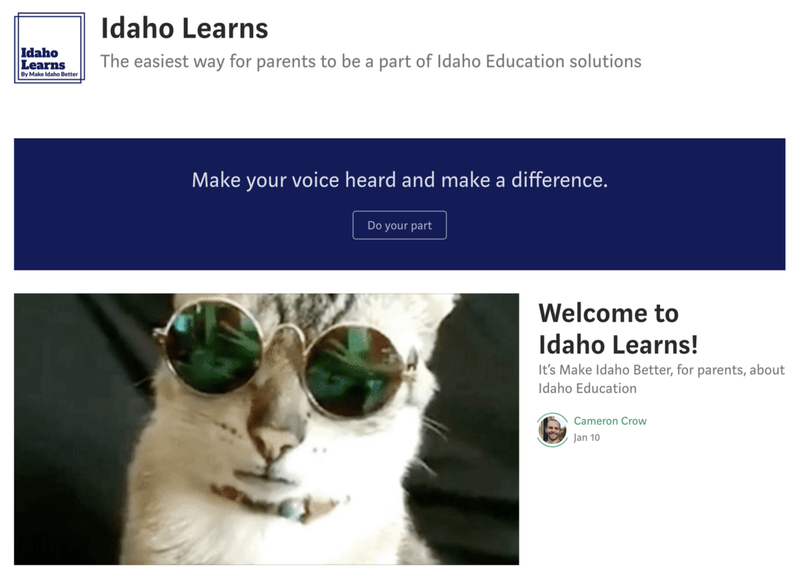 However, there seems to be some confusion about what Idaho’s “go on” campaigns entail — even if kids should continue learning, perhaps college isn’t the right fit for most. 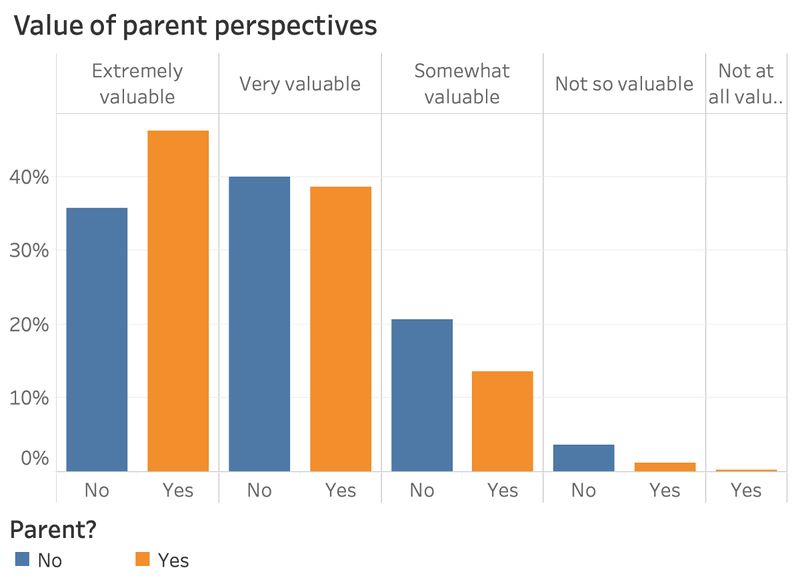 Respondents think understanding parent perspectives on their kids’ education is very valuable. I’m starting Idaho Learns to help with that. Parents have kids in school? Quality schools where you live? More earnings if “go on”? How do you get your info? Education is really important. It has a huge impact on kids and what options they may have in life. Idaho spends over half of its budget on funding education, and thousands of people are working hard to improve student outcomes. We wanted to know people’s thoughts and experiences on the subject. Whenever you look at survey results or findings, it’s a good idea to look at the demographics of the respondents — that can have a lot to do with whether the results are likely to reflect a broad population, or just a niche group. This survey was distributed to our subscribers via email, through Facebook via targeted ads, and was shared by subscribers as well. 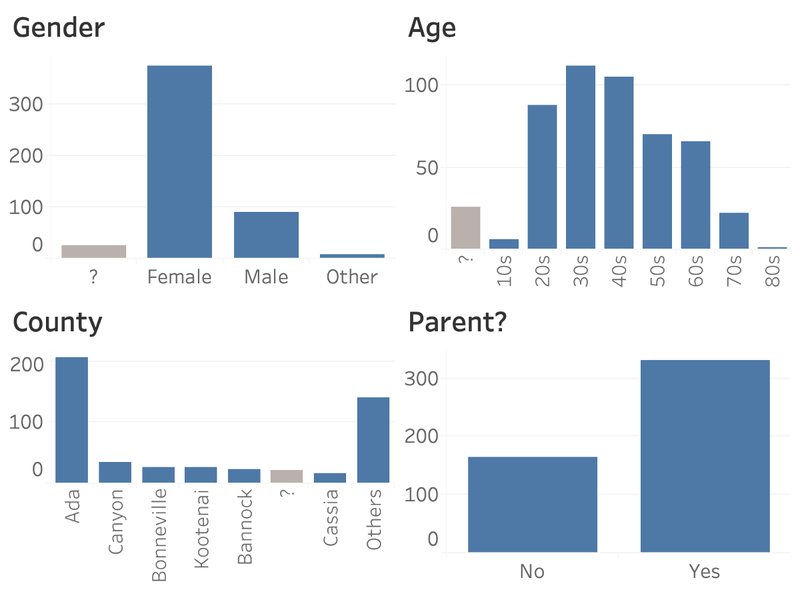 The demographics I collect on every survey are to the left: Gender, Age, and County. I usually include a survey-specific demographic up here as well to round out the visual. We heard from way more women than men (why?! ), all ages, and many different counties but most participation from Ada. And there were about twice as many respondents that have kids than those that don’t. I mentioned above that there are about twice as many parents than respondents without kids, but this survey question gives us a sense of the number of kids respondents have. The biggest group of parents were those with 2 kids (~25%), but we had quite a few with 3 or more as well (~30%). 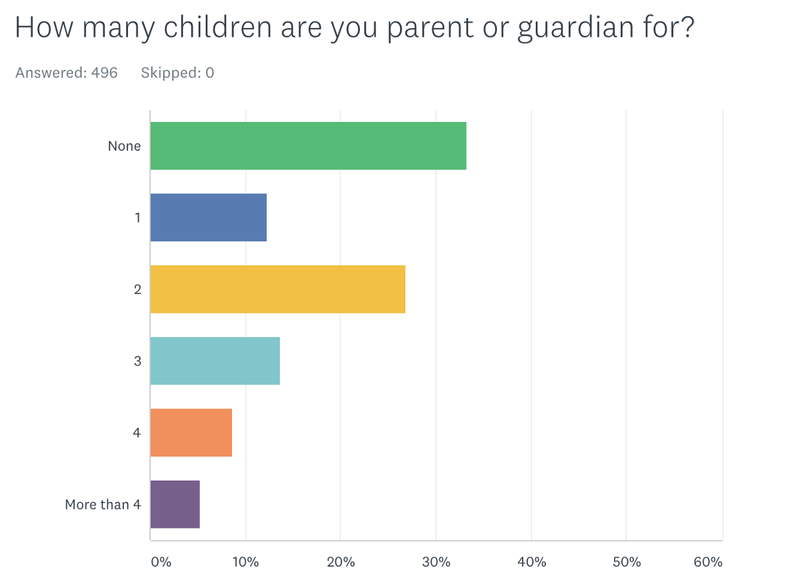 Okay, so there are lot of respondents that have kids. But what ages are they? Are we hearing from just people with kids in elementary school, or other levels too? 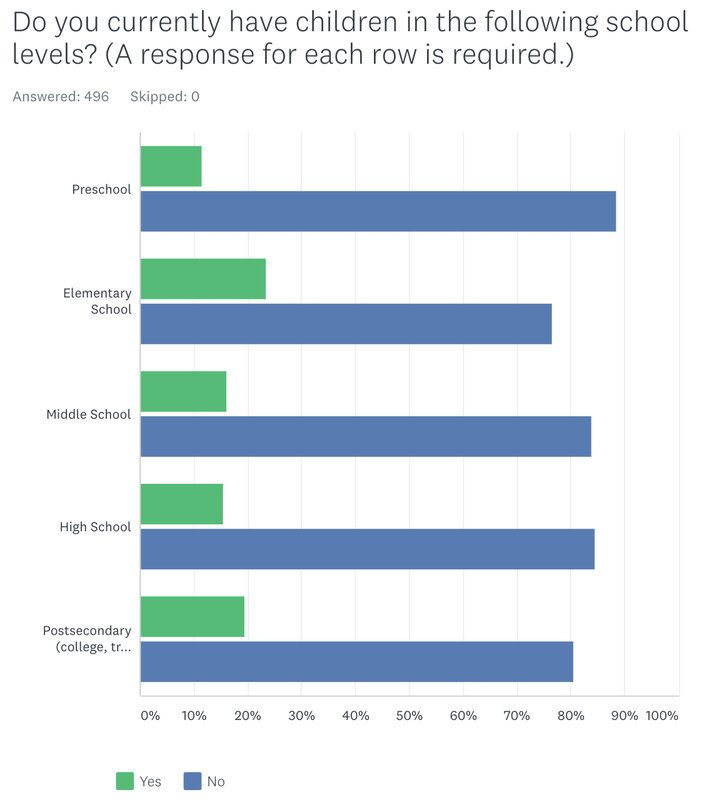 This chart from the overall results shows that we have respondents with kids in every school level, and slightly more in elementary school than any other. The least was Preschool, which makes sense to me since there aren’t public options most places, and not everyone chooses (or can afford) private education. Preschool was definitely a hot topic in the comments, so don’t miss those (at the bottom). But, I was a little unsatisfied looking at the overall chart. 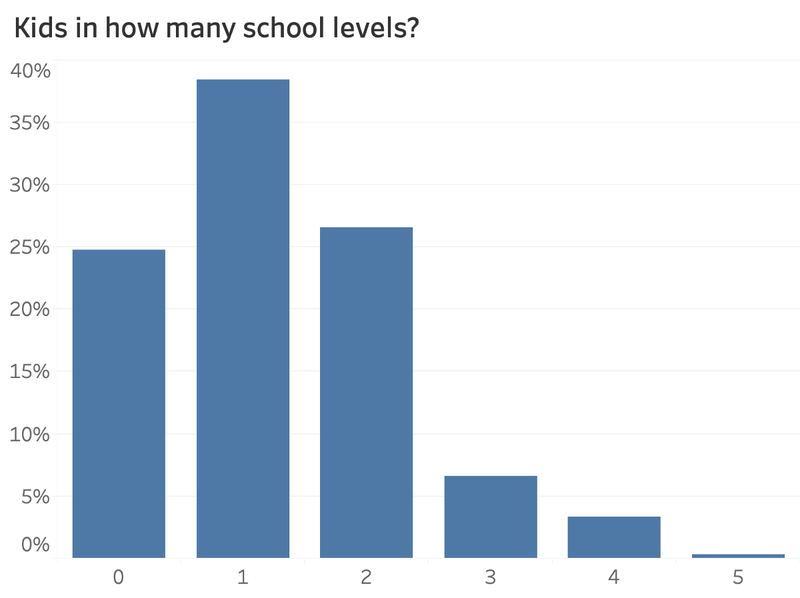 I was curious to know how many respondents have kids in multiple levels of schooling. In theory, those people might be more “experienced” and informed with their opinions. This chart has filtered out all the “not parents” and shows how many different levels each respondent has kids in. The biggest answer was 1 (~40%), but 2 was pretty common as well (~25%). There were also a bunch of parents that don’t have kids in school anymore — probably they’re either too young or have gone through the system already. Interesting to see that we have someone with a kid in every level! That’s impressive. And, that’s got to be a headache! 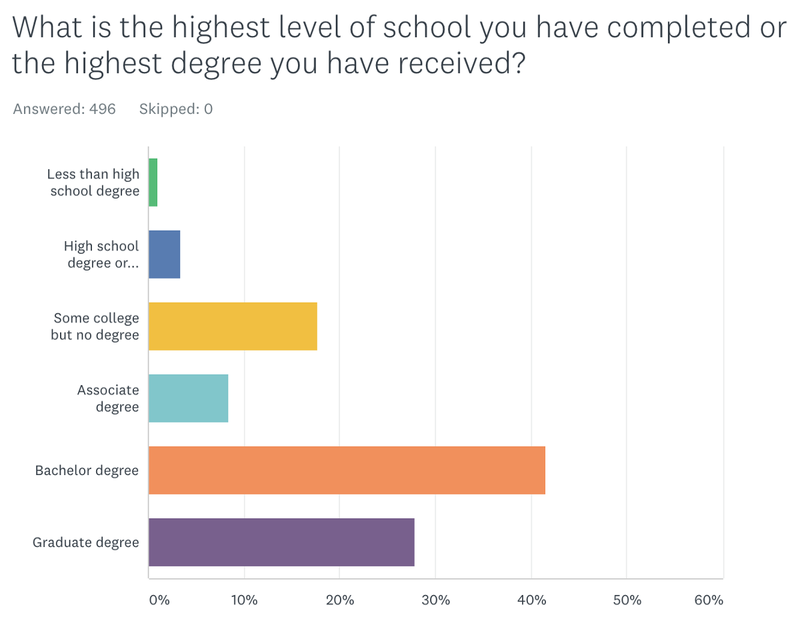 Another context question — this one is pretty standard with surveys: what’s the highest amount of schooling you’ve completed. This can help us determine if people with more or less schooling have different points of view. 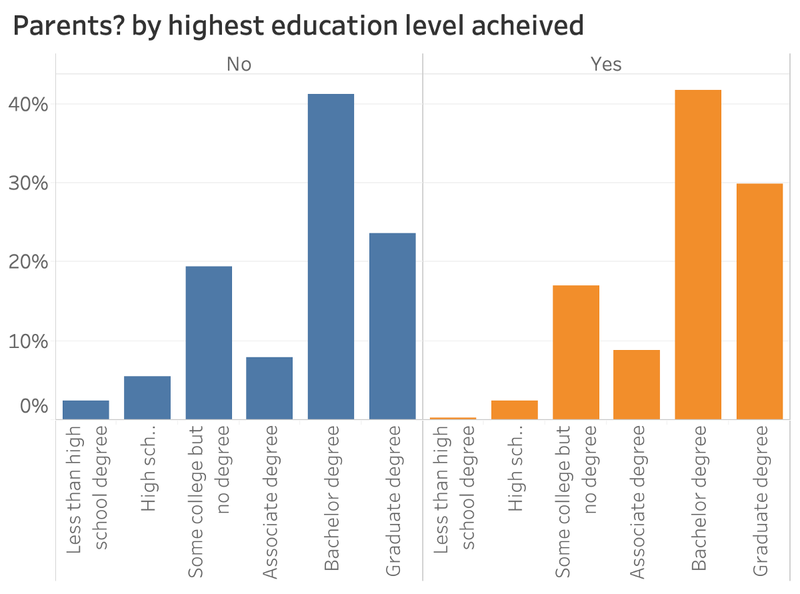 The overall results show us that we’re hearing from a lot of highly educated people — ~70% have a bachelor’s degree or higher, and only ~5% have a high school diploma or less. Definitely good for us to keep this in mind with the rest of the analysis. Next, I decided to segment the education levels by whether respondents are parents or not. I was curious if we’d see less advanced degrees when people have kids. Nope. Proportionally, there are actually more grad degrees in the parents group. Alright. We did our chores with context, and now we can dive into some juicer stuff. 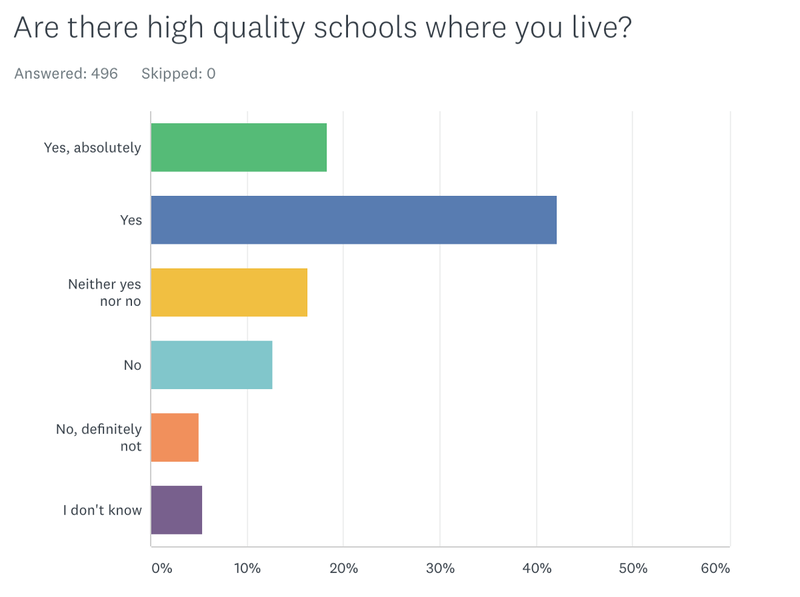 Our first opinion question asked if there are high quality schools where people live. But let’s go a little deeper. Are there patterns in how different counties responded? I was able to make a map and use colors to indicate people’s answers to this question. I substituted 4 for “Yes, absolutely,” 3 for “Yes,” etc. And then I averaged the numbers for each county. 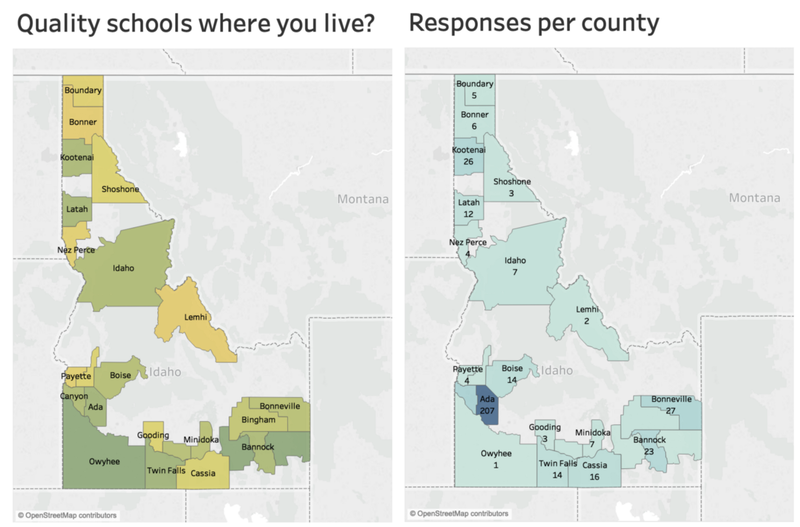 You can see on the left which counties indicated more often that there are high quality schools where they live — the more green, the more respondents expressed higher quality. NOTE: the blue chart on the right shows how many responses we got from each county. For some, we only got a few, so we need to take some of these with a grain of salt. The ones with higher participation might be closer to the truth. It stands out to me that it’s not just major urban areas that people feel have high quality schools. You can see green all over. You can also see yellow (less quality) all over. Ada county (the most populated) seems to fare well, but the averages of some other counties were higher. We know what people had to say about quality where they live, but what do they think about the state’s education system as a whole? This chart from the overall results paints a more negative picture. 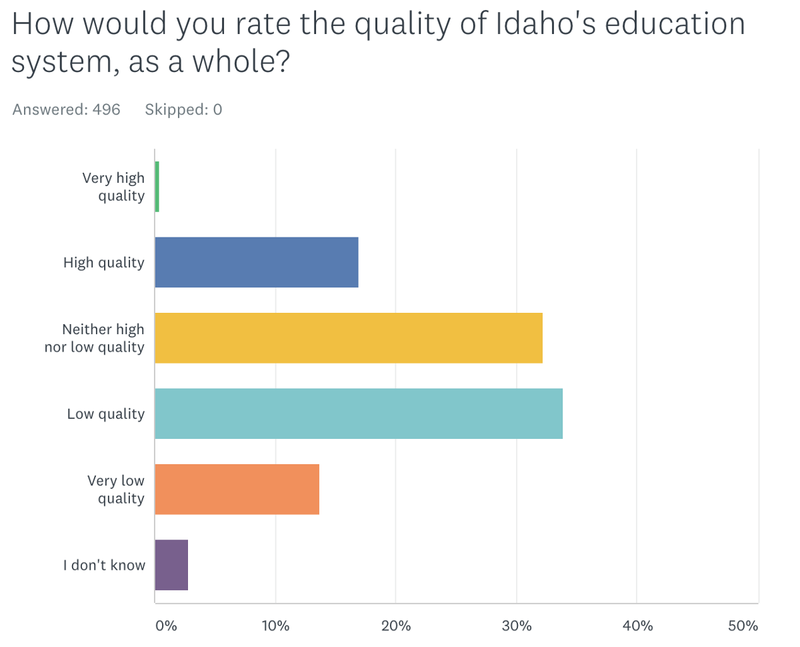 The most common answer was “Low quality” (~35%), and virtually no one chose “Very high quality.” There are a lot of lists reporting that Idaho is one of the worst on different education measures, and I’m guessing that might color some people’s perceptions (this one has Idaho at #47, this one at #30, and this one at #22). It struck me that people seemed to be more satisfied about their local schools than they were about the state as a whole. Let’s look at those side-by-side. Definitely true. It looks like about half of the counties on the left (local perceptions) are green, or positive. On the right (state perceptions), almost every county is yellow, or negative. What’s going on here? Are most people assuming that their school districts are fine, but that the rest of the state is worse off? I made a simple table to compare the local perception rating with the state perception rating. Of the counties with the most responses, not a single one thought the state’s system overall was better than their local schools — it seems like they think the state is worse. Fascinating. This is like the opposite of the grass is greener on the other side thinking. Does the state just have a big PR problem? Ok, we’re going to dive back into context for another question. We know what people think about local and state educational quality, but how strongly do they feel about this? We can get a sense of this by seeing how they rank education against other major issues in the state. 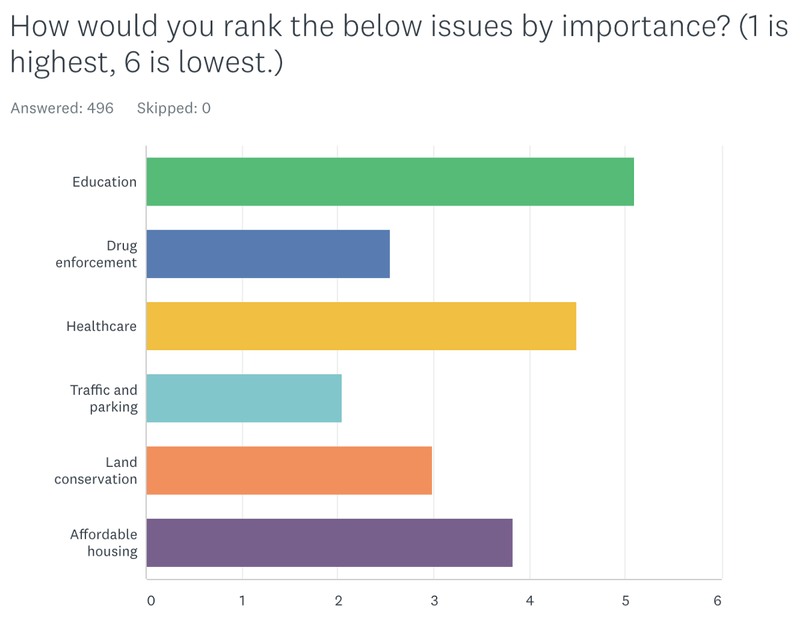 The overall results use a weighted average to show that Education was ranked as the top issue for the most respondents. Healthcare was next up, then Affordable housing, and Traffic and parking were at the bottom. 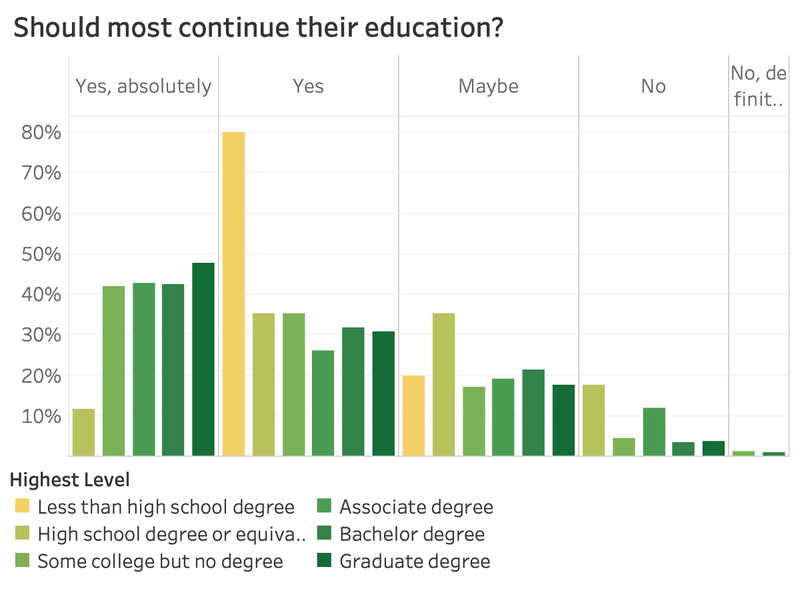 This matches up with scientific research comparing state issues, but I think there’s probably still some bias in here — people that are motivated enough to take an optional survey about Education are likely to think it’s pretty important. Now, I’m curious if parents rank it higher than non-parents. I’d expect they would, since many of them have their kids in the system and want them to get the best opportunities they can. Not true actually. It’s almost exactly the same between parents and non-parents. 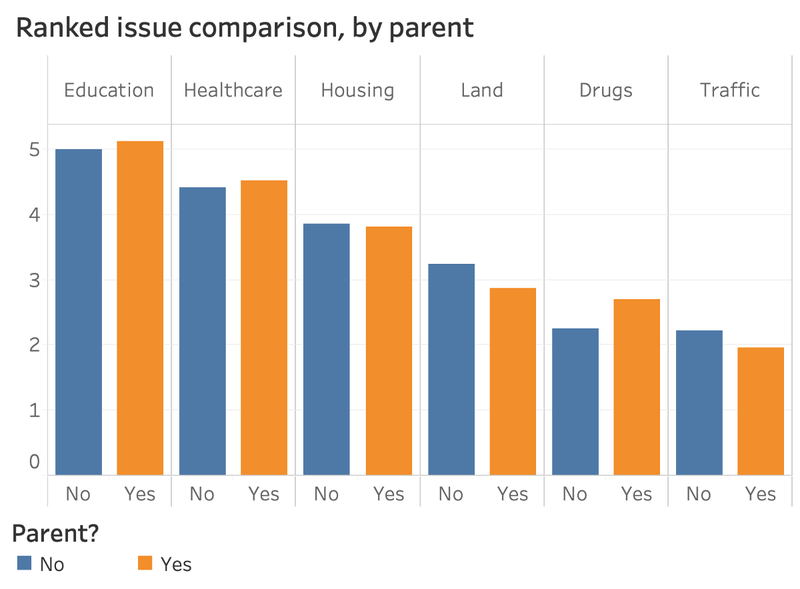 The only changes that seem worth mentioning are parents’ preference to rank “Drug enforcement” a bit higher than non-parents — perhaps that’s a parental instinct to protect their kids? What about age? I’ve heard some people say that older folks are less interested in increasing spending on Education since they don’t have school-aged kids anymore. So, let’s take a look at that angle. Not true, at least with this group of respondents. People in their 60s or “70s and 80s” ranked Education as high as everyone else. 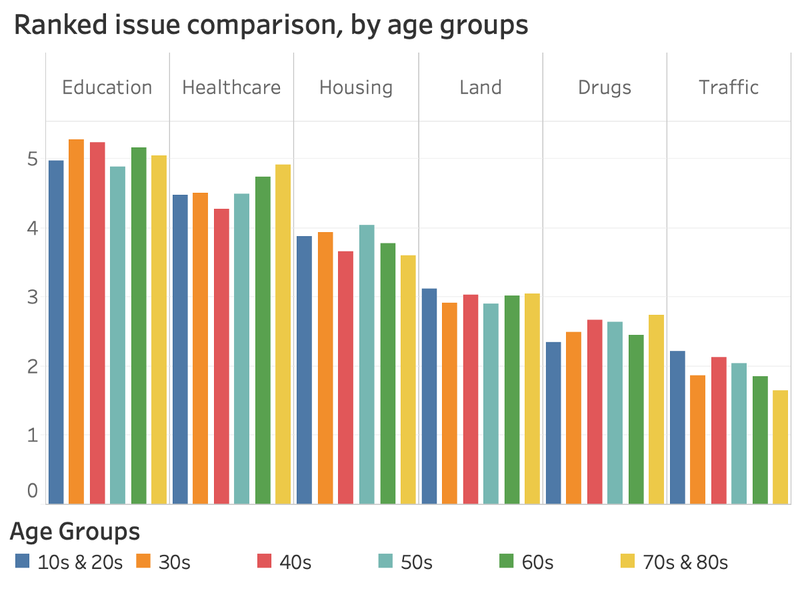 The age-related difference that stands out to me is about Healthcare — looks like there’s an increasing trend from 40s and up: the older you get, the higher you rank the issue of healthcare. Totally makes sense — older folks typically have more direct need for healthcare services. Ok, cool. Demographics, opinions, issue comparisons, and now we can come back to some more education-related perception questions. Next, let’s talk about “going on,” or continuing your education after high school. This is a doozy of a topic, with the state shoveling money at this problem recently and not getting a lot to show for it. Here’s a very “in your face” website about that. Let’s break this down a bit. The parent vs. non-parent angle has been helpful, so let’s try that. Doesn’t look like much of a difference at all between parents and non-parents on whether most people should continue. Still about 75% saying yes. What other slice can we use? Let’s try age again. Not a big difference here either, but it there does appear to be a little spike in the “No” category from 60+ers. 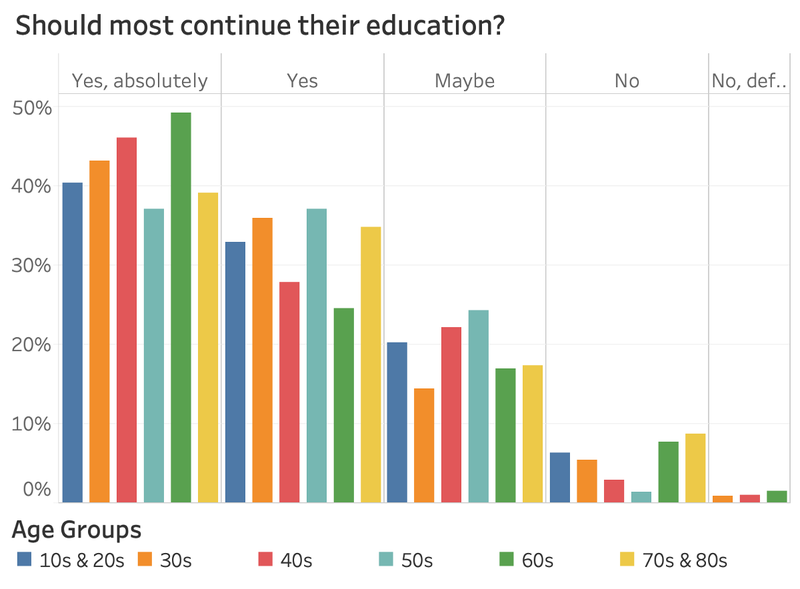 On the other hand, the highest proportion of “Yes, absolutely” comes from the 60s age group as well, so I think we’re maybe looking at a more polarized demographic in our group of respondents. I almost stopped here and moved on, but I thought to segment by respondents’ highest education level attained. I wanted to see if people that didn’t go on to higher education are less supportive of kids continuing. Eh, maybe. The groups that stand out are the “Less than high school degree” and “High school degree or equivalent” respondents. 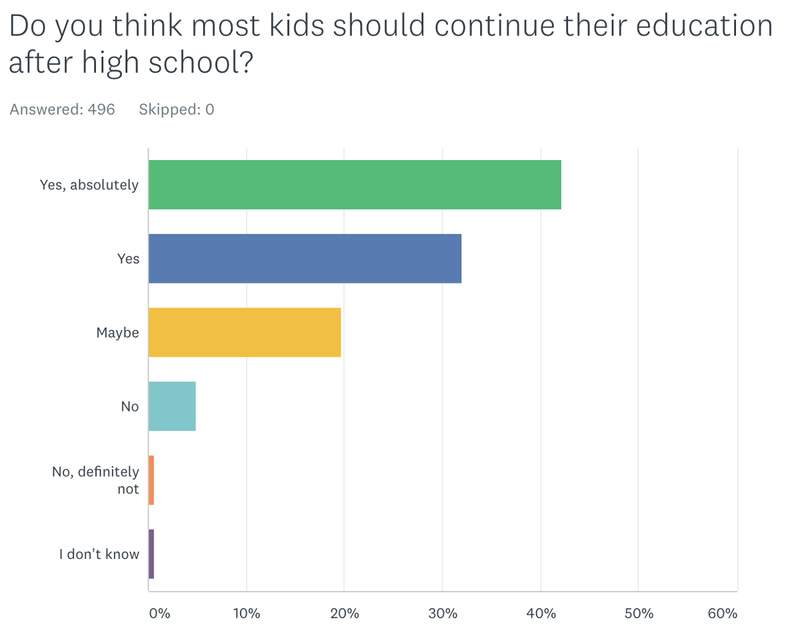 The first didn’t have anyone respond “Yes, absolutely,” but a higher proportion of “Yes.” (There were only a few respondents in this demographic, so we need some more salt here…) And the high school equivalent folks answered about twice as often of “Maybe” as the rest of the demographics. I’m not going to draw any conclusions based on these sample sizes, but it looks like it’s possible that if you have less education, you’re less sure most people should go on. Ok, let’s ask a different question about going on — do people that go on earn more in their lifetimes? I know that the research says this is true, but I’m curious what our respondents say. 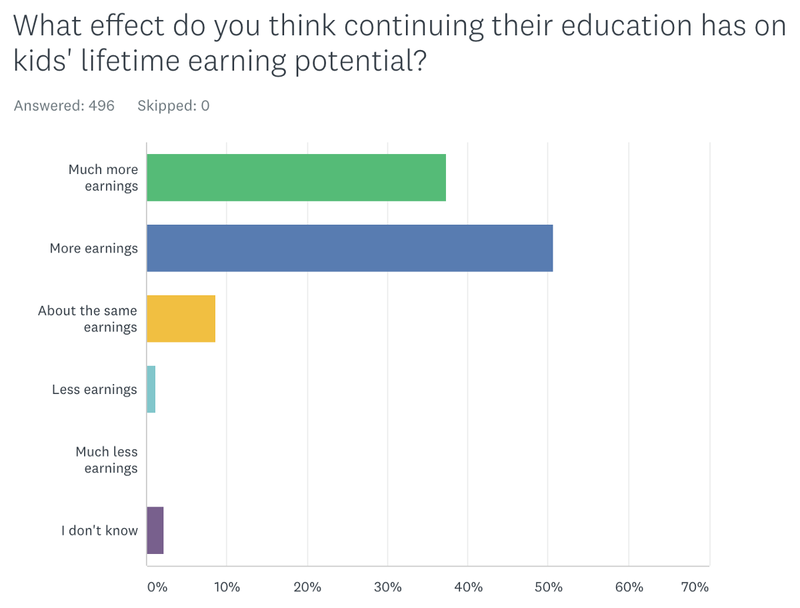 Overall, looks like the respondents agree — more education, more earnings. About 85% said more, and like 1% said less. 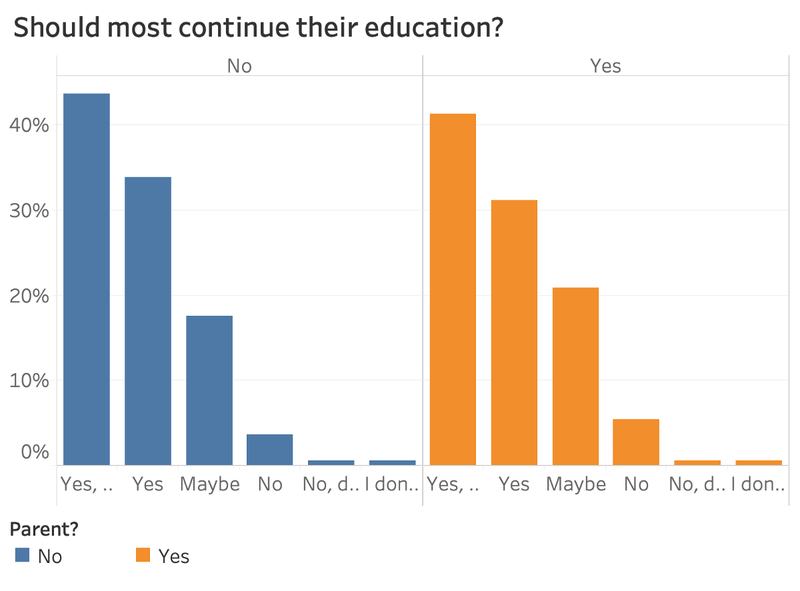 Now let’s slice it by the last segment that was most interesting — highest level of education of the respondents. The standout here looks to be the “High school degree or equivalent” group. Proportionally, they answered “More” or “Much more” earnings half as often, and “About the same” earnings about 2 or 3 times as often. I think those folks either don’t know about the research or don’t buy it. This question is another contextual one, and I think it’s helpful for leaders to understand how they might be able to reach people. 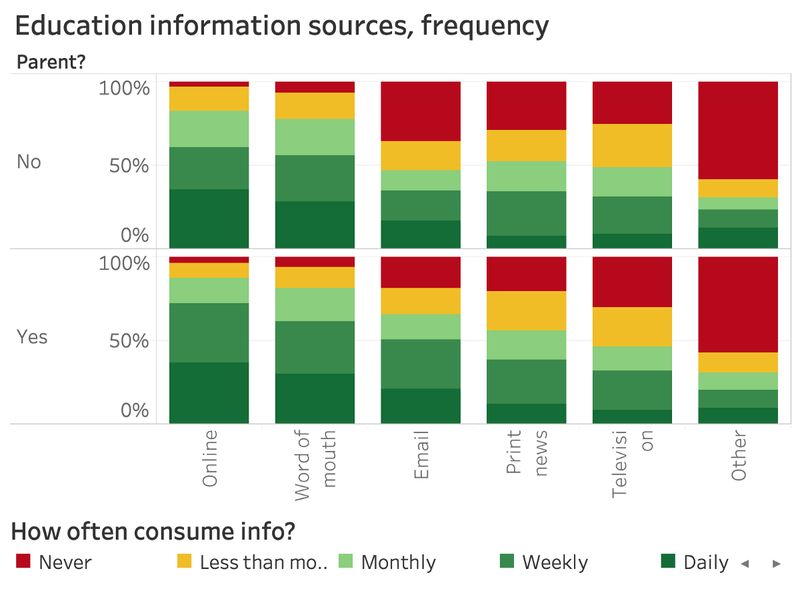 Overall, using a weighted average, people get information most often Online. Next up is Word of mouth, and the least often information source (besides “Other”) is Television. 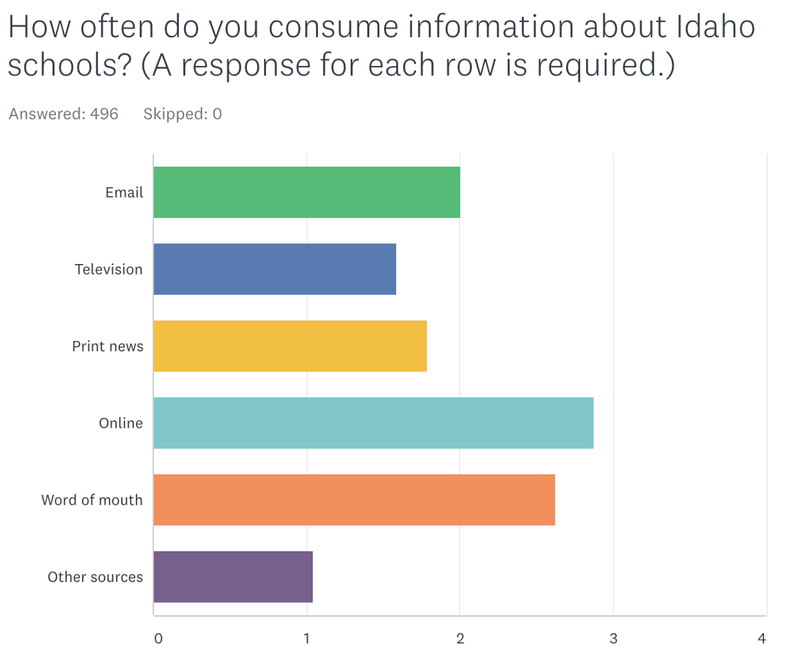 This isn’t that surprising from a group of respondents that are engaging with an online survey — I’m guessing the average Idahoan would report TV as a bigger source. But, I don’t really love the weighted average views (if you hadn’t picked up on that yet). It shows you which one won, but not how the answers broke down on each category. We’ll use my favorite chart (100% stacked bars) for that. 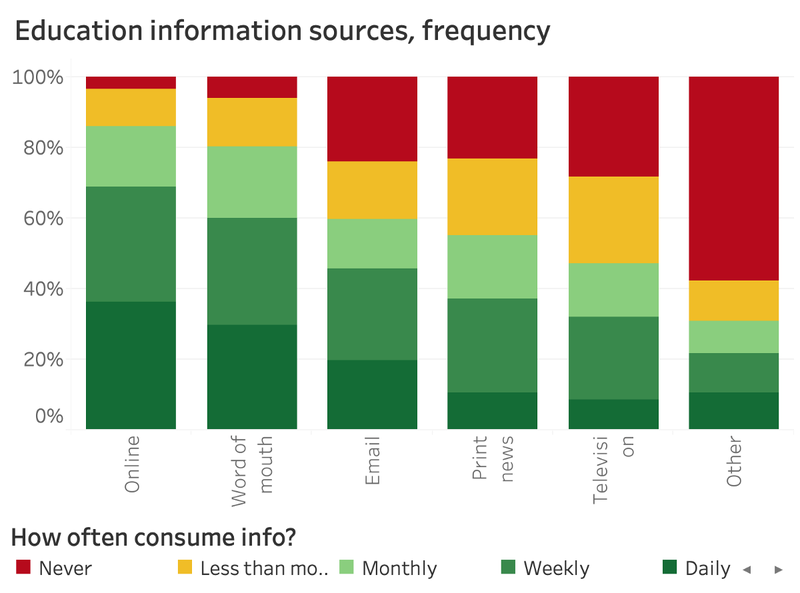 This view shows us what percent of respondents consume information from each medium at each frequency. For instance, ~40% of people consume info about Idaho education online on a daily basis. Also, about 25% Never consume info about Idaho education via Television. Pretty nifty. Though… nothing really strikes me as surprising here. Let’s try the parent view. Lastly, we arrive at the question I was most interested in learning about. 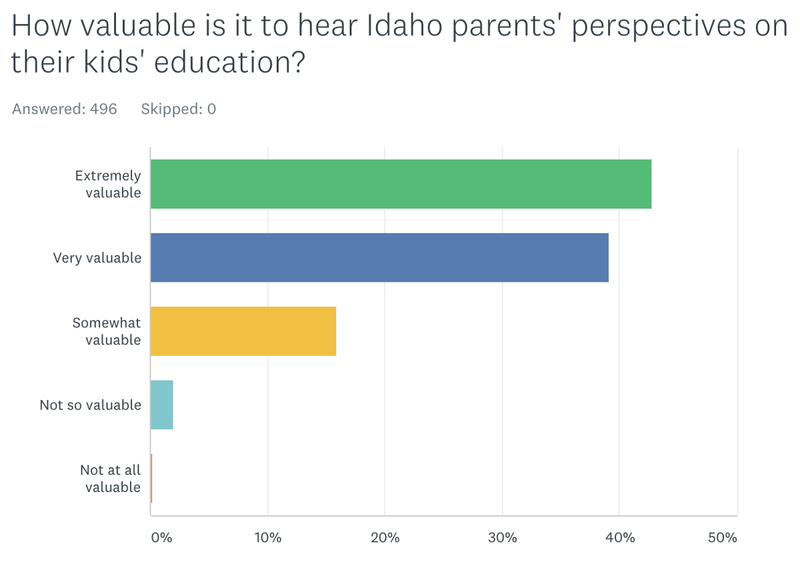 You see, there’s a lot of data out there about Idaho Education, especially about students and schools, but there seems to be very little about parents. Respondents said that parents’ perspectives on their kids’ education are really valuable (~85%). Less than 5% indicated that they’re not valuable, and 15% said Somewhat. That makes a lot of sense to me. From my point of view, parents are the ultimate stakeholder in this whole industry. They’re the ones largely making the choices about where their kids will go to school and when systemic changes are needed. Obviously teacher and administrator’s voices are super important too, but it seems like there are more channels for those perspectives to bubble up than for parents. I also sliced this by parent/non-parent, to see if parents think their voices matter more than the non-parents think they do. Looks to be the case, slightly. But still, non-parents generally think parent voices are very valuable. Cool. That’s what I believe, and what I hoped others’ thought as well. Though this survey was warranted on it’s own merits, it was also a way for me to test my assumptions and determine whether I want to focus more on education topics. I do, and I think parents would like me to as well. That’s why I’m starting Idaho Learns to use the Make Idaho Better methods on education topics on a regular basis, making it easier to see what parents are experiencing and thinking. I think this will be great for parents to know what each other are thinking (particularly in their same district), but also for teachers and administrators to be aware of the bigger picture with parent opinions — they hear from noisy parents all the time on both ends of the spectrums I’m sure, so this can help them understand what the “quiet majorities” might think. College. I believe almost everyone should go on to something more after high school, but for many people that could be trade school, apprenticeships, etc. College is very expensive and shouldn’t be seen as the only option for kids who aren’t sure if it’s for them but all the educational campaigns in Idaho push to go to college. Comparison of testing results. Gets too much attention because the testing system is not reflective of quality education. It is reflective of politics and standards created by people who are not knowledgeable about child development and effective education practices. The Idaho Lottery’s funding of education. This is a regressive tax, why celebrate how little we fund schools that we have to rely on taxing a predatory game? Preschool. Positive effects of vaunted programs have been hard to replicate, so we may spend a lot of money for negligible outcomes. It also seems like public preschool support is sometimes driven by a need for better childcare options, not education. Standardized testing. It is a giant waste of valuable time that could be spent on learning practical skills. It puts undue pressure on teachers and extinguishes any innovation or creativity in teaching methods. Its only purpose seems to tell us what we already know — Idaho is at the bottom in terms of education. Honestly, as a product of the Boise School system, it pains me to say this, but I think the Boise Schools get too much attention. They are performing well while the education outcomes in the rest of the state are lagging behind. We can’t expect to throw all our resources into the largest school districts and expect to have an entire state where we produce educated, well-informed citizens. Charter schools. I am not opposed to them, but they are misunderstood on both sides — proponents and opponents. Attention paid to them has not been complete enough to help people understand a proper balance needed between charter and public schools. If you were to watch the news, it seems like the only activity schools are involved in is football, basketball, occasionally soccer and volleyball. Sports are not the focus of school! Idaho’s Go on Rate. This rate is misleading because it insinuates that enrolling in college immediately following high school is the best option for those pursuing an education. This is not the reality. There are many productive alternatives to college that high school students can participate in that are not captured by the Go on Rate. For instance, joining the military, trade school, an apprenticeship, church service, and humanitarian service would all provide valuable and educational experiences. As Idaho citizens we should be more concerned with our high school students’ plans and productivity than their enrollment numbers. What parents think about education. It seems like parents largely focus on whether a new education initiative or policy is recognizable to their own experience in grade school or how it impacts the logistics of their life (homework, scheduling, etc). They also only care about their kid’s education, and don’t see the big picture. How much money is being allocated to education. It’s not a money problem, other than repairing old schools and building new schools to deal with population explosion. More accountability for how money is being used should be addressed. Creationism and the anti climate change perspectives enacted into Idaho education law. Science should be taught as proven fact, not treated like myth. Teacher pay vs quality of teachers. My 3 kids went through Idaho public schools and my grandson is a first grader. There are some excellent teachers who should be paid accordingly and some who are horrible and shouldn’t be teaching at all. The bad ones up their pay by getting a master’s and years of service increases instead of improving their teaching skills and outcomes. If your principal likes you, your quality of teacher doesn’t matter much. Wilder School District. It’s cool what they are doing there in their school district, but it doesn’t seem like that’s a solution that will fit all over Idaho. Charter schools performing better than public schools. It’s like comparing apples to oranges. Also, school vouchers. Vouchers weaken the school system not strengthen it. PreK and college education. It is not the state’s job to provide preschool so that parents can work. Preschool is not necessary and PreK education can be done in the home. Especially if the state gives parents the expectation for what children should know going into kindergarten. Also, with post high school education, too much emphasis is given on every kid going to college, when that is not the best option. I think post high school education is important, but trade schools, apprenticeships, etc are better options for many students. Teachers making more money. They get paid very well between salaries and benefits. If they want more they should try getting another job with the benefits they get now for the days they actually work. No other profession pays so well or offers such good benefits in the private sector. Also pushing students to go to college, the trades are just as much important if not more than some college degrees. There seems to be a lot of coverage about different ways schools are teaching, but not any focus on the effectiveness of the changes.. There was a recent article in KTVB about Kuna schools and various programs they had, but the article fails to point out that the schools under perform by about 20 percentage points below the state average. Testing. No wonder kids don’t want to respect school. They are tested more than they are taught. This is not the fault of the schools, but rather the problem created by government officials/politicians who do not know the first thing about education. Parents tend to blame everyone but themselves. Students tend to blame everyone but themselves. Teachers and Faculty tend to blame everyone but themselves. Community tax payers tend to blame everyone but themselves. It’s time to stop pointing fingers and uniting around our children to ensure a robust and strong educational “SYSTEM”, which means everyone must do their own heavy lifting without complaint or excuse/scapegoat. We all benefit from children gaining the tools for a 21st Century Society. If you need proof, check the headlines of the bone-headed decisions made by an under-educated society… Trump is our litmus test. We failed. May we not fail tomorrow’s test. Tests, Common core, the idea that everyone would take the same classes because everyone “has” to be good at the same thing by a certain age. Plus grades and the thought that it’s a 4 year degree or nothing; if you can’t get it you’ll end up at Wendy’s. Also the fact that kids are seen by adults and their peers and colleges as their gpa when they are so much more then a number. they are people, not just a thing made to complete work to show their value. Their value is their ability to grow and learn and I mean deeply grasp and hold on to it. Charter schools — they are lauded but the only thing different I see and have experienced is they are exclusively for kids that are white and above average. They are promoting segregation and are in no way better. Kids feelings get too much attention. People need to get pushed to succeed and that is often derailed in today’s public education. That’s why more and more people are going to private schools. The buildings. No one needs a fancy new school to learn in, but every bit of important talk about education I’ve heard in the last year is about the building the kids are taught in. I honestly can’t believe that not having a smart board in a classroom will be a detriment to a child’s education. Also, college. What happened to tech schools? Tech careers have 95% placement, standard college has 40%. Tech careers make on average $50,000 per year starting salary. College-backed careers start on average at $25,000. But, please, continue making our tech colleges into community colleges. It is outrageous how little we spend on education compared to other states. You can invest in prisons or schools. That teacher pay is the problem of why we can’t retain good teachers. I believe there’s some truth to that, but the bigger problem is the amount of requirements being put on the teacher with a lack of “man power” to help support. Teacher burn out is a big factor. I would love to see a survey that’s given only to Idaho teachers to get their views on why Idaho teachers are leaving. Too many resources are spent on administration, transportation, nutrition, etc. Too many parents are dependent on the schools to care for their children, the focus needs to shift away from these things that have nothing to do with the actual education of our children. Money is the exclusive focus in the school district I live in. Money is necessary and funding shortfalls can be a real problem. However, we keep passing levies and the school district is still doing early releases, cutting sports teams, and driving out quality teachers. If it is not managed well, more money solves nothing. I think we need to introduce more trades during middle and high school. So many kids could benefit from realizing they may be able to specialize in a trade early on. Also, I believe that we need to be focusing more on skills that will help them go out on their own. Things like budgeting and taxes, even things like how to meal plan and grocery shop. I know that a lot of this is supposed to fall on the parents but there are tons of kids out there that have parents that don’t even know how to do these things. That rural schools somehow should provide the same educational opportunities as urban schools. People move to the city because that’s where the jobs and opportunities are. If you choose to live in rural area, you will have reduced access to services, jobs and educational opportunities. It’s a simple choice. And impact that parents have on children’s education is more important than teachers or the school. Buck up and take responsibility for your child’s education and future. Stop blaming others. Idaho has pretty progressive policies like the Advanced Opportunities Fast Forward program that provides $4000 to each student for AP, college & tech classes, and the learn to earn internship/apprentice program. Boise Ind District does a great job of providing & communicating opportunities to families for students with different aptitudes. Do the rural districts have a vocational high school option like Dennis Technical? 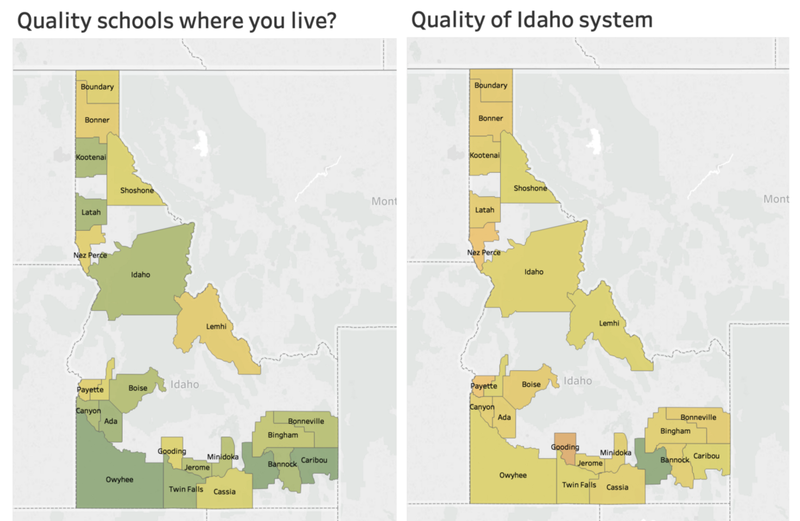 How do we bring the smaller and rural districts up to the same quality level as Boise? The fact that state standards are only at the minimums for federal requirements. It is incredibly difficult to compare schools across state lines because each state has developed separate standards. So a high level school in MA is incredibly different than a high level school in ID. Secondly, there are great programs in ID that enable kids to graduate HS with a diploma as well as a college degree, the problem is making sure the education level of each student is where they need to be in order for them to be successful in the college class settings as well as how to enroll and successfully take advantage of these programs. Parent engagement; parents need to be engaged with their students learning and holding them accountable to their work. Teachers usually have 20+ students in 1 class with multiple different classes. It is the students job to keep track of their work and their parents job to help them do that. That Idaho’s education system consistently ranks at the bottom of national lists in almost all categories. There are school districts in this state that don’t have enough money to provide classes five days a week. What does that do to a family that has two working parents — which is the majority of families with children? Families are left having to come up with childcare every week, not to mention the missed education time for the kids. Further, our schools are so desperate for teachers, or worse, the system is so backwards and far-behind, Middleton Elementary didn’t fire their racist teachers. Something tells me that’s probably not the only case of teachers acting inappropriately in this state. 1. Misuse of money by the government — both state and federal. Poorer districts are not served well the way money is distributed. 2. The stranglehold on schools’ ability to dismiss bad or under-performing teachers so that taxpayers could feel better about paying teachers higher salaries that they deserve and need. 3. Responsibility of parents to teach manners to their children so that the schools can function the way they were intended. The ability to discipline has pretty much been taken away from teachers, which means more money spent on administrators whose primary tasks are discipline. 4. Better explanation of Common Core. 5. The need for fixing the problems with public education rather than gutting them by pushing charter schools. Idaho has wonderful teachers, who are doing innovative work under less than optimal conditions. Teaching is a demanding job. One must be a nurturing mother, a disciplining father, a corporate CEO managing a wide range of activities, a mentor, a professor, and a diplomat. We expect this of our teachers, yet pay them as if they were nothing more than babysitters. Few people really understand what teaching really entails. While extracurricular activities, such as sports, gets too much attention, academic extracurricular activities gets too little. Financial Literacy. Idaho grades relatively well in financial literacy when compared to other states, but I think that speaks less of Idaho’s ability to prepare high school students for the real world, and more to the inability of the country to prepare our youth for their financial future. Idaho requires that high school students graduate with an economics credit, which in many cases is there primary opportunity to learn financial literacy. Unfortunately, they’re not learning much in there either because often times the teachers in those classes are outside their realm of expertise, and/or there just isn’t enough time in a semester to cover all the material. Financial literacy is topic that will be immediately applicable to these students, regardless of their education or career choices, and therefore should have more of an emphasis in Idaho schools. The failure of Common Core and how switching to that standard has negatively impacted students who were previously high achievers. Common Core was not a fully developed curriculum, it was poorly implemented, teachers are not allowed to teach other methods of learning that may better meet a student’s understanding and it has caused many kids to hate school because they feel like failures. There are different ways to learn. Quit choosing just one and trying to pigeonhole every kid to meet that agenda. Worst thing Idaho could have done for it’s students was opt in to Common Core. It’s a teach to test program, nothing more. The need for education opportunities outside of the K-12 and college systems. More focus, if not money, put into adult literacy and Career and Technical Education, a.k.a, vocational education. 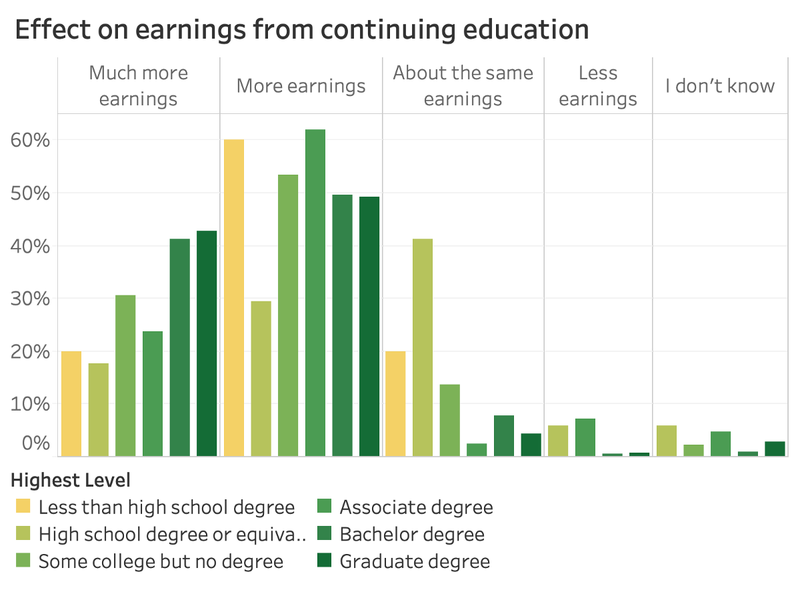 Not everyone should go into traditional college-based programs and the push by the K-12 system to “go to college” leaves out a vast swath of potentially high-paying and satisfying careers. Most overlooked opportunities in the valley are the CTE programs at CWI and TVCC. Below grade level interventions (why half a class of middle school students are somehow reading at a 4th grade level or lower); how can we get more kids to grade level before it impedes learning and creates challenging behaviors? How can we hold students to deadlines (a skill important to career retention and college success) when mastery based grading doesn’t require it? Why are paraprofessionals paid in a way that doesn’t reflect their role in the classroom? Why are people hired as paraprofessionals when they have no educational experience or experience with diverse learners and often need to work with the most challenging student population? Why are Idaho teachers not valuable enough to be paid a wage that is at least competitive with other professionals who receive a Bachelor’s of Science degree? Why don’t teachers have more options for additional endorsements post graduate that can be taken online while working full time in Idaho? Inequality in educational experience & opportunity throughout the state. A child in rural Idaho should have the same educational opportunities and facilities as a child in Boise. Also, there is a need to start calling attention to the shift of education funding from the state to property owners and people who play the lottery. I’m a strong supporter of education but I’m done voting for bonds to increase my prop tax until I’m convinced it’s not just replacing funding that s/b coming from the state. I’d also love to know how much lottery revenue has supplemented educ funding and how much has simply replaced state funding. The amount of teachers leaving the profession. And the fact that teacher pay is worse now than it was years ago (counting for inflation/cost of living). People forget that teachers spend as much time with kids as parents (sometimes more) during their formative years so we need to invest in teachers. Teachers pay for too much out of their own pocket. We trust teachers with our kids, we should give them something like a corporate credit card and trust them to use it wisely to supply and decorate their classrooms. And just trusting and respecting teachers more in general. Parents, administrators, the government like to blame teachers and in a lot of ways make their job harder while not offering real support or trust. More focus should be put on letting teachers teach, and less on teaching to a test. Tests can be a good way to assess students, but as a former teacher, I know students above mediocre are ignored to get low end students test ready. End of year testing is a poor education plan. Where to begin, teacher pay and why they deserve to be paid more. They are treated as glorified babysitters, not the highly educated professionals that they are. Rural schools do not receive enough funding, while big cities such as Boise, Idaho fall, twin falls receive more. Rural schools take up roughly 75% of schools in the state. The fact that educators can no longer effectively discipline kids, because of all the rule and regulations in place. Kids are able to stay in school even if they are a danger to others because the state makes it so hard to expel students. There are a lot more problems with education and it will take a major overhaul to fix it. And that overhaul needs to be by people who have actually taught in the classroom and know what it will take. Not politician who only think they know. The increase in salary is a step in the right direction, but more needs to be done. The number of unqualified, uncertified people in the classroom “teaching” does not get nearly enough attention. These emergency hires have three years to get certified, but so many people including politicians do not value pedagogical training. Teachers need to know more than content, they need to understand pedagogy, management, and child brain development to be effective. Research has shown time and again that there can be up to two years’ worth of negative impact for every one year that a student is in a classroom with an ineffective teacher. Our kids are suffering because of the teacher shortage. There are not enough people wanting to go into the profession. We need to do things to make it an attractive profession again, which includes money but does not only include money. A lot of it the reason people don’t choose the profession or leave the profession is the support for public education (or the lack thereof), the vilification of teachers in the media and by the government, the blaming of teachers for society’s ills, and the lack of personal responsibility of parents and students for the parts they play in learning/education. The management of administrative personnel, and the ridiculous job most of them are doing. They are not supporting teachers and often make the job miserable. State officials rarely ever listen to the complaints, nor do the eliminate principals/superintendents who do a poor job. The teachers and staff have nowhere to go when things are bad! Actual education does not get enough attention. We do not receive adequate education regarding science, especially on pressing issues, such as climate change, species extinction, deforestation, etc. We are taught to memorize information, scribble it down on tests, and forget it following the class. College does not prepare you for anything in Idaho, other than learning how to memorize information and test well. Yet, the paper that states that you completed college can dictate your success in the future. The education system is extremely broken. Much more state funding for education and leaving the Feds out of it except to meet requirements for curriculum and civil rights standards and basic equity (including under-protected demographics such as the LGBTQ community, which is facing outrageously disproportionate violence & suicide among youth). Stop teaching to the test. This state has one of the lowest per student funding rates in the nation and we trail in teacher hiring and retention as well as performance standards and post secondary rates as a result. Rather than blaming teachers and administrators for falling short of goals, we should be boosting funding to ensure better resources and prioritization of educational achievement and bringing “passion” back to education, inspiring student growth rather than mandating compliance. Finally, can we get some pre-school and kindergarten funding and mandatory attendance standards in place? If children do not get a smart start to education, they lag and fall short of progress over time. High income students get external support, while low income students/families get the shaft. Tomorrow’s jobs requires today’s high quality education. Parental involvement. Every single study on parents shows that more involved parents equals better grades, increased understanding of material, and better long-term success. But our education systems routinely shut parents out of the learning process, refuse to listen to suggestions, and batter participating parents into submission. As an educator in an elementary school, we aren’t focusing enough on providing resources for early interventions and Special Education. When those departments crumble, the entire general education classroom crumbles. Kids have such high social/emotional needs these days. We need to address having more counselors, psychologists, nurses, and support staff, to assist the needs of a school. In addition, the jobs for custodians, bus drivers, para educators, and classified employees are not competitive. These jobs are imperative for the school to function. Dyslexia, 1 in 5 students have dyslexia, but there is limited resources. I have paid thousands of $ on both my children just to be screened and more for therapy for tutors. All of it out of State. My school district has IAP’s and 504 and don’t follow them. There is no assistance for families with children of dyslexia. I can’t afford to send my child to private school for dyslexia. If every child was screened for reading disabilities, early intervention has proven to improve higher graduation rates and literacy. A study have of shone, that over half of the prison population, has a learning disability. States that incorporates ready program around learning disabilities out perform Idaho. Why do we rank at the bottom. The attitude among officials in our school district is indifferent to the children’s needs and extremely concerned about presenting the school positively for public relations. We need better, less political leaders who make it a goal to clear the way administratively and let good teachers teach kids! Less admin more teaching!